As Plain Speaker reported in December 2013, Calderdale Council is investing in fracking and other fossil fuel companies via the West Yorkshire Pension Fund. This has continued, even though in December 2014 the Council passed a motion to “take all possible steps” to protect Calderdale’s environment and people from problems arising from fracking. Plain Speaker has asked Cllr Tim Swift for an update. 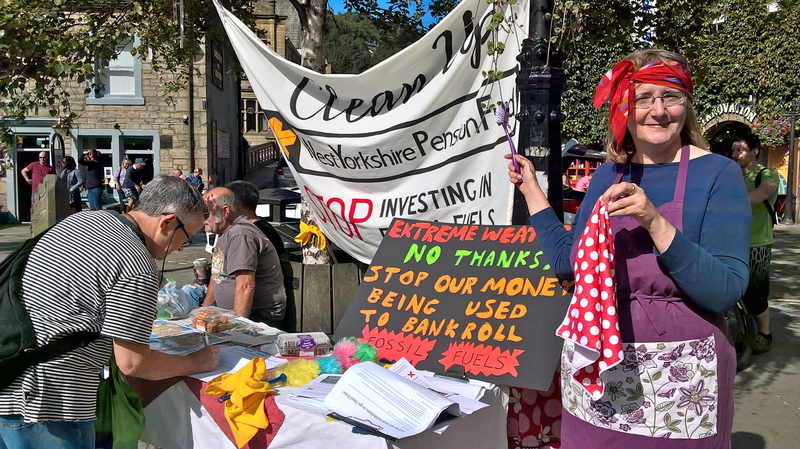 West Yorkshire Pension Fund members are working with Share Action and Client Earth to get the Pension Fund to disinvest from fossil fuel companies that are causing climate change, and invest in clean technology. The financial sector warns that investments in high-carbon industries will prove financially risky in the future, as regulation limits the amount of carbon that can be burned and so restricts the scope of fossil fuel companies to extract oil, gas and coal from beneath the earth’s surface. Since a lot of the value of fossil fuel companies is based on “their” underground reserves of oil, gas and coal, Mark Carney, Governor of the Bank of England, has said that investors face “potentially huge” losses from legislation to reduce carbon emissions because it could make vast reserves of oil, coal and gas “literally unburnable”. This entry was posted in Energy and tagged Calderdale Council, Fossil Free West Yorkshire Pension Fund by jenny. Bookmark the permalink.